Assault Sport Pre Workout By Muscle Pharm at SameDaySupplements.com® for lowest price. What Is Muscle Pharm Assault Sport? Muscle Pharm Assault Sport is the athlete's pre workout. Muscle Pharm Assault Sport recreates the pre workout category with an exaggerated focus on strength and performance to more adequately fuel the athlete within. Anchored with Creatine Monohydrate, Assault Sport Pre Workout works to replenish the phosphate bond lost due to intense exercise, restoring what was once ATP to re-energize and re-fuel your muscles allowing you to maintain your muscular endurance and increase overall energy expenditure. Additionally, Creatine Monohydrate has the affinity for drawing excess water into the muscle cells, keeping your muscles hydrated, nourished, and full. Alongside creatine monohydrate are Beta-Alanine and Betaine Anhydrous. Beta Alanine is known to buffer lactic acid that builds up as a result of strenuous exercise. By reducing this build up, the body can combat muscle fatigue and extend your workout even longer. * Betaine Anhydrous can aid in improved protein synthesis. Also featured in Muscle Pharm Assault Sport Pre Workout is the Muscle Fuel blend which contains L-Glycine, an amino acid, and precursor to creatine, which fights muscle degradation by boosting the body’s natural supply of creatine, as well as help deliver glucose to the muscle, and L-Taurine, which serves as the electrolyte regulator, ensuring a proper balance of electrolytes is delivered to the muscle. Lastly, there is the Energy & Focus blend, which contains Caffeine Anhydrous, a central nervous system (CNS) stimulant that relieves drowsiness and restores mental alertness, and Acetyl-L-Carnitine, a carnitine compound known for transporting long chain fatty acids into the mitochondria to be converted as energy that also contains an acetyl group, which contributes to the production of the neurotransmitter, acetylcholine, known for improving mental focus, clarity, and the mind-muscle connection. 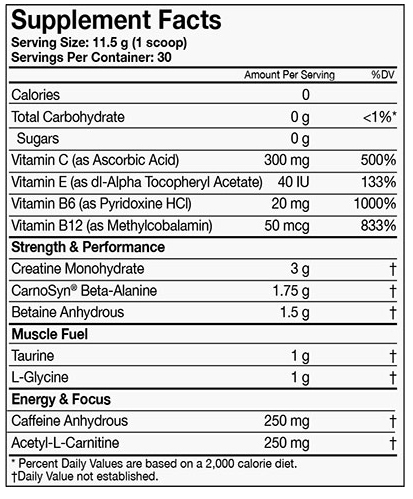 What's In Muscle Pharm Assault Sport Pre Workout? How Do I Take Muscle Pharm Assault Sport Pre Workout? Mix one serving (1 scoop) of Assault Sport Pre Workout in 8-12 fl. oz. of cold water and drink 20-30 minutes before training. Do not exceed one serving of Assault Sport Pre Workout per day. For healthy adults 18 years of age or older ONLY. Consult with physician, if using prescription or over the counter medications, or have pre-existing conditions like: high/low blood pressure, cardiac arrhythmia, stroke, heart, liver, kidney or thyroid disease, seizure disorder, psychiatric disease, diabetes, prostate enlargement/urination issues; or if taking a Monoamine Oxidase Inhibitor or erectile dysfunction medication. Discontinue use 2 weeks prior to surgery. In case of adverse reactions, discontinue immediately and consult health professional. Contains caffeine. Do not use; with caffeine/stimulants; alcohol, nitrates, under extreme conditions of heat, sleep deprivation or dehydration. Do not exceed recommended serving or use if safety seal is broken. KEEP OUT OF REACH OF CHILDREN. I buy only in the samedaysuplementos. The best virtual store for supplements. Delivery to Brazil was very fast. I recommend this site. The best online store that exists. Thank you samedaysuplements. We have a large selection of in-stock Muscle Pharm products including Pre Workout items and others for the lowest prices at SameDaySupplements.com® It's always easy to shop for Assault Sport Pre Workout By Muscle Pharm at SameDaySupplements.com® because you can browse by reviews, brand, prices or search for specific ingredients using our search tool. In-stock orders placed before 3pm EST ship out the same day to USA, Brazil, United Kingdom, Canada, Germany, Australia, Japan, India, France and worldwide at the cheapest prices online.